I’m not old enough to have grown attached to Perl. When I learned Perl people were already looking at Ruby and Python and proclaiming glorious victories. At that same time I saw people gripping Perl, not willing to leave their witty, terse confidant for those prettier, risky “New Kids on the Block.” I had dabbled with PHP and wanted more power. Perl was the natural choice. Previous experience, I thought, told me that I wanted a programming language where symbols, not words, held power. I quickly saw that in Perl. There were scripts nearly 50% symbols performing enticing feats with less characters then a Java Hello World program. So I took a look at Perl. As is the case with most Perl programmers I felt right at home. Perl has a tendency to do whatever you, the programmer, want’s it to do. “Do you want to suddenly make this variable in the middle of an if statement’s condition? Sure, why not, you’re the boss!” I instantly fell in love with its regular expression support. Learning to exploit the s/// statement alone has probably had far more impact on my entire programming career then any college course I’ve taken. The idea of a default variable was a poison I was happy to swallow. It just made so much sense. My interest in Perl stopped when I saw its Object Oriented behavior. However, by that time I was far more interested in its scripting power. 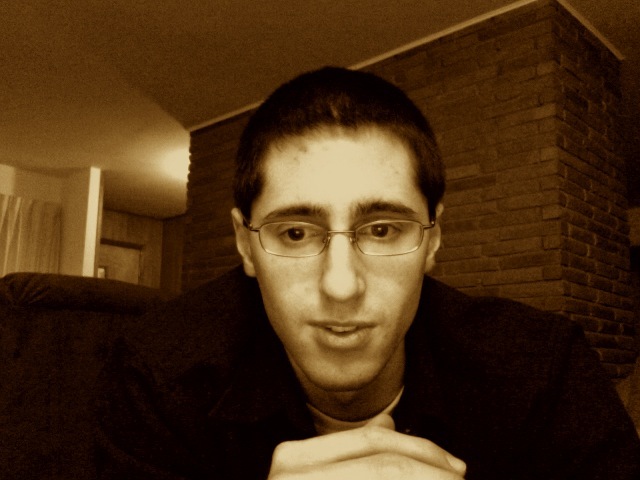 I took a very close look at Perl’s syntax and grammar. 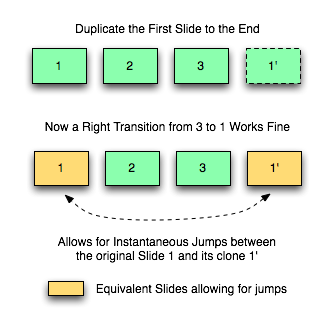 I knew every optional space… every optional semicolon… how to reduce an entire program to a single line and then reduce it further and further with dirty tricks. I ate up as many of Perl’s special variables as I could, spitting them out into my scripts. Why write “n” when $/ is two less characters… Essentially I learned to “Perl Golf.” It is the art of dwindling a simple script program down to as few characters as possible. This “black magic” side of Perl that got criticized by so many was a dangerous, but fun, sandbox that I spent my time in. Then, it all stopped. Normally, whenever I had a few weeks I would spend them learning a new programming language for fun. When I learned Perl I had three weeks off from school before I was to start my first Co-op. Time flew and my “fling” with Perl had to end. Little did I know that Perl left a rash on me that needed to be scratched. This disease made other programming languages look disgusting. Why is it so hard to parse files in Java, why is there no built-in regular expressions support in C++, what is wrong with these languages?! Time went on. I was given another two weeks. 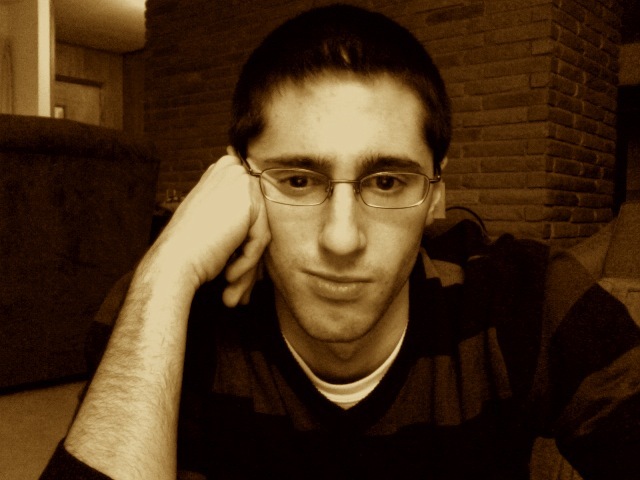 Around that time I had made a decision that I would invest my personal time into web development. I spent hours and hours reading, learning, experimenting, grasping, producing, and all that jazz. It was reaching the end of those two weeks and one thing had been continually pounded into my head… Ruby on Rails was going to be big. I was young, I wanted in! With little time left in those two weeks I figured my time would be best spent focusing on Ruby and investing in Rails when I got more time. 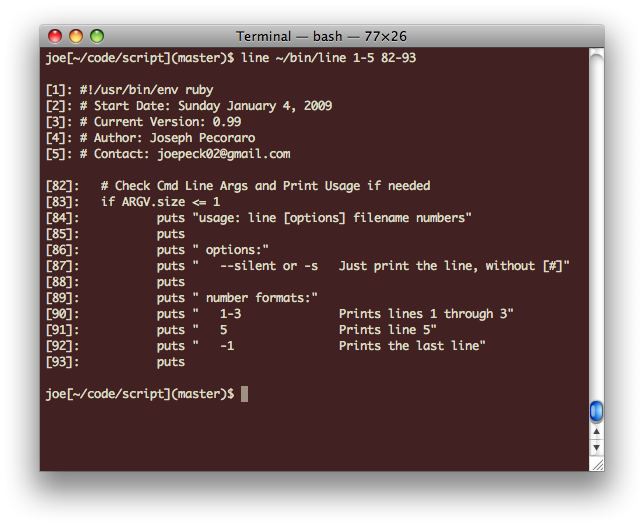 I honestly haven’t gotten around to learning Rails yet because I was so enamored with Ruby. Learning Ruby was initially painful. I’ll admit it. I took a pass at it and was disgusted. To be honest, I can’t remember what was so painful. For one, I was intimidated by its block structure. Being as immature as I was, it felt too verbose… like a sore thumb in the language. But what the hell did I know? I still gave it a shot. This book had a greater impact on me then just teaching me Ruby. It reaffirmed what I had seen from all over the web. Ruby users had a sense of humor, they tended toward creative expressiveness instead of technical explicitness, they invested in fun, they were not satisfied with the mundane. Also, the idea that a tutorial could be a story changed the way I thought about teaching in general. I made it far enough to drop my misapprehensions about Ruby’s syntax and embrace something Ruby did well at, Objects. The more I used Ruby the more I realized that I wouldn’t need Perl. All my special variables were there. Replacing s/// with gsub was painful, but undeniably cleaner. 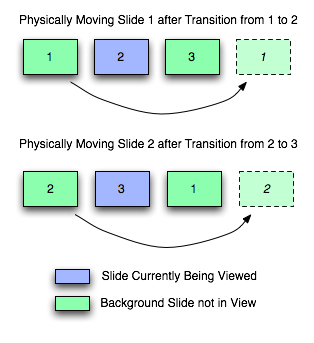 I had matured slightly as a programmer and saw the need for code clarity and I now enjoyed Ruby’s block structure. When I challenged myself to create a simple Object Oriented program I saw how Ruby’s classes removed a lot of the repetition I normally put into Java classes. I was pleased. Finally I was impressed with ruby gems. 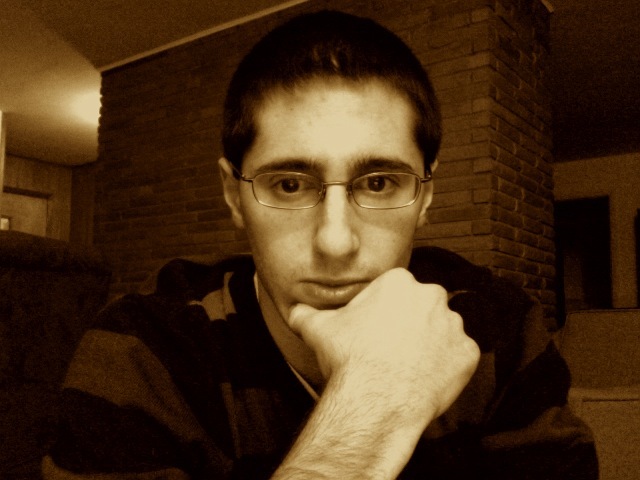 Need an html/xml parsing library and you’re unhappy with Ruby’s? Fine, `gem install hpricot`. Its so easy to download a new library, or even a new tool like `gem install cheat`. 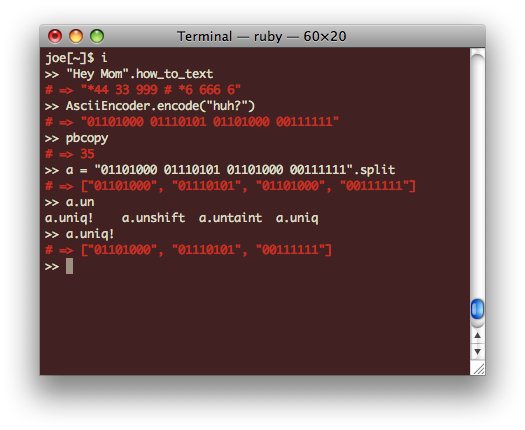 I liked the idea of distributing ruby scripts via gems that I even made my script a ruby gem (regex_replace). That way I can quickly download/install on any machine that I need it. The ability to build off of existing Ruby libraries is exciting. As clichéd as that sounds, I feel like it can only get better. 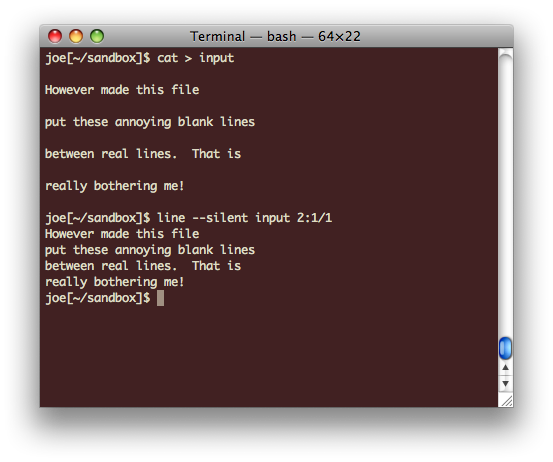 I’ve gotten comfortable enough with Ruby that I now write all my day-to-day scripts in it. 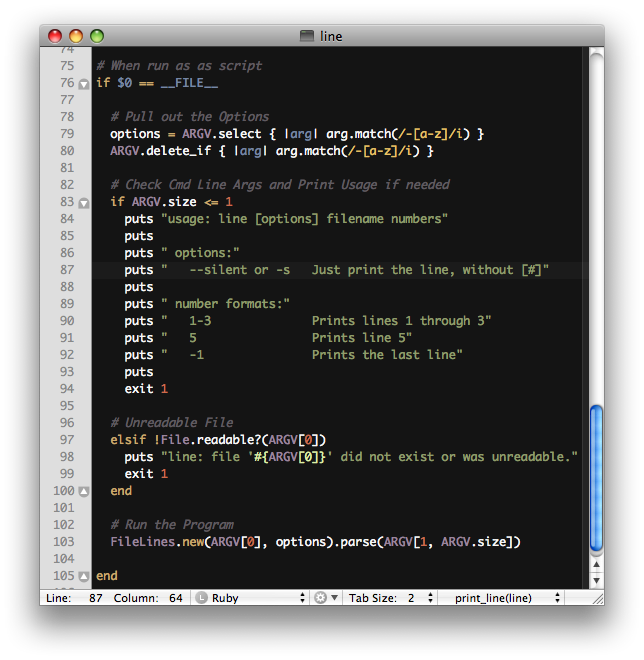 I’m truly glad that I learned Perl, because it introduced me to the scripting world, and it is a unix staple. But, like so many others, it seems like there is a brighter path. I think thats more then enough for today. puts "usage: line [options] filename numbers"
puts "   --silent or -s   Just print the line, without [#]"
puts "   1-3              Prints lines 1 through 3"
puts "   5                Prints line 5"
puts "   -1               Prints the last line, (negative)"
puts "   ~5               Prints 2 (default) lines before and after 5"
puts "   4~10             Prints 4 lines before and after 10"
puts "   *7 or 8*         Prints all lines before or after the number"
puts "   5/1              Prints 5 lines, then skips 1 line..."
puts "   2:5/1            Starts at line 2, prints and skips..."
I think these new formats are pretty neat. You can always access the latest version of the script on Github or in my ~/bin. I’m willing to change the syntax and introduce new concepts. Send suggestions my way by dropping a comment! Cheers. I decided to play with some more jQuery plugins. I’m building up some experience, learning a lot, and having a ton of fun doing it. So, what did I decide to do this time? 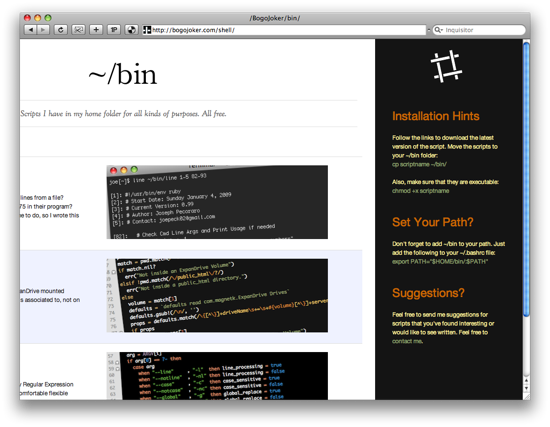 I added a sidebar to ~/bin. When you click on the logo in the top right an instructions panel will slide out on the right hand side of the screen. There is also a little magic going on with the logo. I also wanted to play around with some jQuery lightboxes. The one that always comes to mind is facebox. For once I didn’t have to make any major changes to the source of this plugin, instead I made a few small tweaks to the CSS. 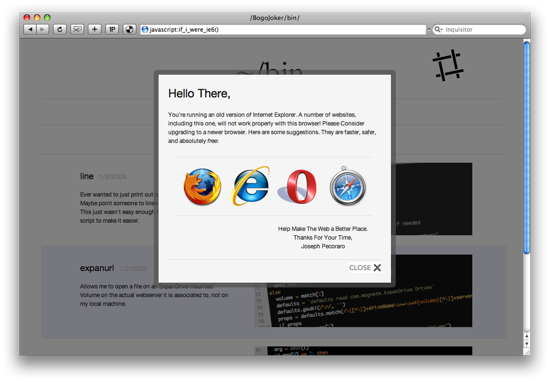 Sure that looked great, and it had a nice message, but it ended up looking disgraceful in IE6 itself! Rather then scrap the work I left it there, to prove the point to whatever few IE6 visitors I get. The facebox works perfectly in IE8 (I haven’t tried IE7) and so I can make use of what I’ve learned elsewhere I just hope that IE6 will go away soon. I said my goodbye already. 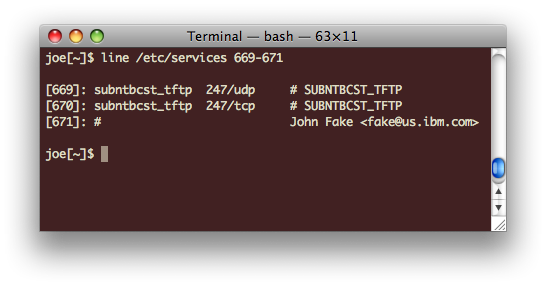 The other day I wanted a shell command to have somebody print out the 671st line of /etc/services on their computer. So I gave it some thought, then some more thought, scratched my head, and figured out that I couldn’t really think of a shell command that does that. A google search came up with a few `sed` and `awk` examples but I honestly found those to be a bit awkward for something that should be super simple. So I wrote my own script. line is now the latest addition to my ~/bin. Also, in case you wanted to use this in a shell script or via piping, there is a `–silent` or `-s` switch that you can use that removes all of the special formatting, and prints only the specified lines. 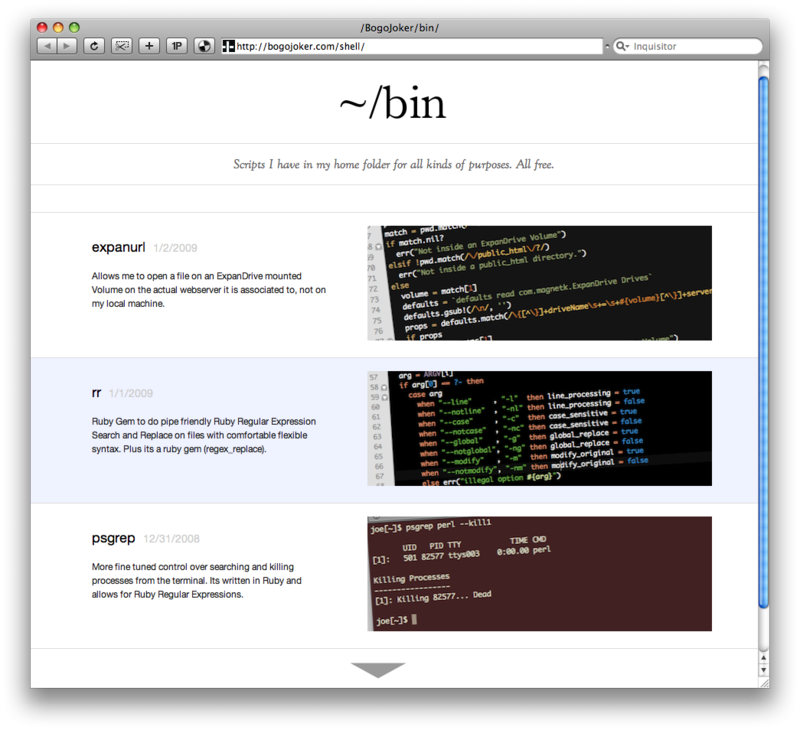 Much nice for scripts. (See the highlighted line in the image below). Enjoy!